So you want to be a travel photographer? Well, you’ve come to the right place. I’ve been a travel photographer for 20 years, ever since I left my suit-and-tie/shined shoes job as a VP/Group Supervisor at a NYC advertising agency. Since then, I have traveled to almost 100 countries documenting fascinating cultures, incredible wildlife and exotic locations. What fun, even though on some trips I had to take malaria medicine (which gives you strange dreams), get shots for typhoid and yellow fever, and get hepatitis A and B booster shots. In addition, on most trips I had to take Imodium. The worst deal was being seasick. Speaking of being seasick, do you know that there are two stages to being seasick? In stage one, you feel as though you are going to die. In stage two, you wish you were dead. Okay, onto some serious stuff. In this article, I’d like to share with you some of my best tips for travel photography. 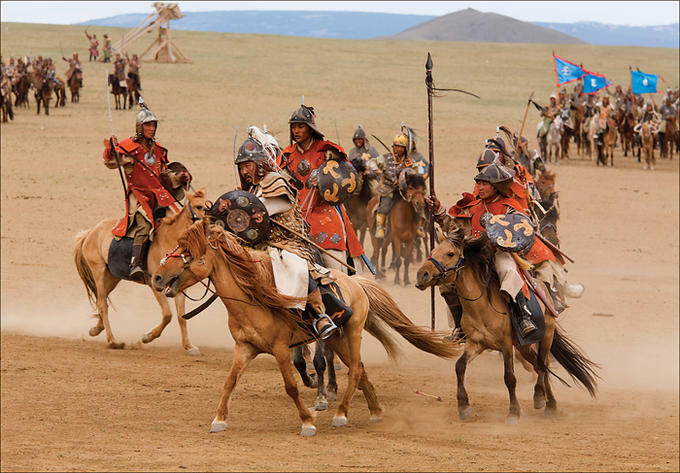 I’ll also share with you some of my favorite photographs, includes the initial photograph for this article that I took of some Mongolian soldiers during a festival in that fascinating country in 2007. If you go on a safari, dress for success and for protection from the animals. Photo vests and jackets not only make us look like professional travel photographers, but they are practical. All those pockets are great for giving us fast access to photo accessories, such as filters, memory cards, a flash unit and even lenses. A signed model release is required if you plan to use a photograph of a person for commercial purposes. The release has to say that the person gives you the right to use the picture for commercial purposes. It should have space for the person to print his or her name, be signed by the person and include the date. Someday I hope to sell this picture of a woman (Image 2) who I photographed in Marrow Bone, Texas. Good thing I have a release. Guides and translators are most helpful when traveling into foreign counties. Not only can they actually save you time in searching for a particular photograph, but they also may be able to help you see places and people you normally would not have the opportunity to see. If you don’t arrange a guide through a travel agent, you can usually get one through your lodge or hotel. Without a guide, this picture of a Huli Wigman (Image 3) would have been hard to get, and the location would have been hard to find. A good guide is worth what is often the least expensive part of a trip. I travel with a laptop, a card reader and a backup drive or drives (Image 4). Image processing programs (Photoshop and/or Aperture/Lightroom) are loaded on the laptop, complete with the latest RAW Plug-in or application update so that RAW files can be opened. That’s an important point. If you have a new camera and don’t have the latest RAW Plug-in or application update, you may not be able to open your RAW files. That has happened to a few of my workshop participants, who were not happy campers as a result. When traveling, pack an AC power strip so that you can charge your computer and camera battery at the same time. When visiting a foreign country, make sure you have the correct power adapter plug, which you can find at electronic stores. If you want more digital photo on the go info, check out my book, Rick Sammon’s Complete Guide to Digital Photography. Here are some tips that may help you take better people pictures when traveling to far-away places, as well as when you shoot close to home (Image 5). We prefer pictures of people in which their pupils are open wide more so than pictures of people in which their pupils are closed down. That’s one reason why we like pictures of people taken in subdued lighting conditions, in the shade and on cloudy days—situations where the pupils are open wider than they are in bright light and on sunny days. Black-and-white portraiture is attention getting, but contrast is actually more important than removing the color from an image. So think contrast, which you can add with a reflector or flash, when taking people pictures. The majority of famous painters “illuminated” their subjects from above and to the left. For whatever reasons, we seem to like that kind of lighting. Here are three of my pictures that illustrate that lighting technique. Hey, if it works for famous painters and if it works for me, it will work for you! In very low light and at night, your eyes have an ISO of about 800. Mid-range digital SLRs have a high ISO setting of 1600, and high-end digital SLRs have high ISO settings of 1600, 3200 and even 6400! In effect, a camera can see better at night than you can— don’t stop taking pictures when the light gets low and when the sun goes down. Here’s another fun fact when it comes to people photography: check out my new book, Face to Face (see end of article for a special discount on the purchase of this book). It’s packed with fun (and practical) tips on photographing people. My guess is that when you are traveling you will not be photographing with the Green Mode (fully automatic) on your digital SLR! Rather, you’ll use the creative modes on your camera to take great travel shots, not simply snapshots. Due to the low light level, you’ll need to set your ISO to 400, 800 or maybe even higher. Set your camera on the M (manual) mode and dial in the correct f-stop and shutter speed combination for a good exposure—but make sure you have a shutter speed of around 1/8th of a second. Take a test shot. Your subject(s) will be blurry, but don’t worry. At this point you are only testing the natural light exposure. Turn on your accessory flash (or pop up your built-in flash) and set it to TTL (fully automatic exposure). Now here’s the secret to capturing the motion. As soon as you press the shutter release button, move the camera from left to right or vice versa. It’s that motion of the camera that helps to create the sense of motion in the scene. You’ll need to experiment with different slow shutter speeds to get the precise effect for which you are looking. I took eight shots to get this one. If your subject is over- or underexposed, you can use the flash exposure compensation feature (on the accessory flash or in-camera) to adjust the exposure. Simple as it sounds, there is a big difference between taking a travel picture and making one. When you take a picture, you simply point and shoot. When you make a picture, you think about all the elements in a scene and how they can complement each other. You think about the lighting and the background and the foreground. And you think about the mood you want to create with your picture. For this picture (Image 7), which I took during Carnavale in Venice, Italy, I made the picture by adjusting the lighting (from one strobe), positioning the subject so that her reflection was in the mirror. I also had her look right into my lens for direct eye contact. Perhaps the most useful screw-on filter (as opposed to a digital filter) for landscape photography is a polarizing filter. A polarizing filter can continuously vary the amount of polarized light that passes through it. In doing so, it can (but not always) darken a blue sky and make white clouds appear whiter (Image 8). A polarizing filter can also reduce reflections on water to the point where you can see through it. A polarizing filter is most effective when the sun is off to your right or left. A polarizing filter is not effective when the sun is directly in front of or behind you. Another important fact is that a polarizing filter can make your pictures look sharper, because it helps to reduce reflections on atmospheric haze. My favorite landscape wide-angle zoom is my canon_17-40. Set at the 17mm setting and with an f-stop of 11, I can get tremendous depth-of-field in my pictures—if I set the focus 1/3 into the scene. That lens is about half the price of the canon_16-35 lens. The f/2.8 lens allows a great amount of light into the camera, making it better suited for indoor and low-light level photography. However, I do most of my photography outdoors, so for me, and outdoor photographers who want to save some money, the 17-40mm lens is a good choice. If you look closely at this picture (Image 9), which I took at Bodie Historical State Park in California, you’ll see that it’s tack sharp and everything in the scene is in focus. I took this close-up of an iceberg (Image 10) with my favorite telephoto zoom lens for landscape and scenic photography: my canon_70-200/4Lis. As I did for this Antarctica photograph, I often like to zoom in on a particular area of a scene—to isolate part of the main subject. Telephoto lenses can also help to “cut the clutter” in a busy landscapes scene, scenes in which there is really no main subject. Travel photographers, as well as those who read travel magazines, enjoy a beautiful sunrise and sunset. Here are some suggestions to capture those magical moments. Do a web search to find the time of the sunrise or sunset. Bring a telephoto zoom and a wide-angle zoom. Photographs taken with a telephoto zoom show the sun larger than it appears in the photographs taken with a wide-angle zoom. Set your camera to the RAW image quality setting so you can capture a wide contrast range. Set the ISO to 100 for the cleanest (little digital noise) possible photograph. Remove any filters on the lens so as not to get a ghost image of the sun in the photograph. Compose the scene with a foreground element. Frame the scene so that the horizon line is not in the center of the frame. Placing the horizon line near the top or bottom of the frame is more pleasing. Set the shooting mode to Aperture Priority mode, the metering mode to Center-Weighted, and the Exposure Compensation set at -1. One of my goals in sunrise and sunset photography is to preserve the highlights in the scene, In this picture (Image 11), which I took in Kenya with my canon_100-400, lens set at 400mm, the clouds around the rising sun are the highlights. If the highlights are overexposed, I reduce the exposure until I get a good exposure of the highlights. I also take several exposures during the sunrise so I have a selection from which to choose the best. I also wear sunglasses and try not to look directly into the sun. One of the cool things about digital SLR cameras (and top of the line compact digital cameras) is that you can control the shutter speed to either stop or blur action. When I photograph fast-moving animals, and even slow-moving ones, I often choose to freeze the action—because I want a sharp photograph. A shutter speed of 1/500th of a second is usually fast enough to freeze most fast-moving animal action, but when the animals is moving extremely fast, as was this seagull in flight, I had to use a 1/2000th of a second shutter speed. I learned that through magnifying the previous images on my camera’s LCD monitor, and seeing that in the pictures taken at 1/500th of a second the bird was a bit blurred. When photographing fast moving animals, I recommend setting your camera’s frame advance to the highest frame-per-second rate possible. Doing so will help ensure a nice photograph of the animal, in this case, one in which one of the seagull’s wings was not covering its face (Image 12). In addition, you want to set your auto focus mode to the focus-tracking mode—this enables your camera to track a fast moving subject. Although I take wildlife photographs when I travel, I am not a full-time professional wildlife photographer. Most of those folks use expensive fixed focal length lenses to get them up-close-and-personal with their subjects. For folks like us, zoom lenses, I think, are a better choice. They are more affordable for one thing. For another, when you are locked into a shooting position, as I was when photographing this sunset scene in Botswana, you can zoom in and out of the scene, fine-tuning your composition in camera (Image 13). Technically speaking, fixed focal length lenses are sharper than zoom lenses, but for folks like us, that’s a moot point, because we can sharpen our pictures in the digital darkroom for our enlargements. Fixed focal length lenses are usually faster (having a wider maximum f-stop) than zoom lenses, making them better suited for low-light photography. That’s also not a big deal for us, because we can easily boost the ISO in low light and reduce the digital noise that is associated with higher ISO settings either in-camera or in the digital darkroom. Having said all that, my favorite zoom lens for photography is my Canon 100-400mm f/4 IS lens. Previously, I talked about the difference between fixed focal length lenses and zoom lenses. All that tech talk about fixed focal length lenses being sharper and faster applies here, too—as does boosting the ISO and reducing digital noise (Image 14). My favorite zoom lens for wildlife photography used to be the canon_16-35. However, when Canon introduced the canon_17-40, for about half the cost, I sold my 16-35mm lens on eBay and picked up the 17-40mm lens. It’s super sharp at f/8, which is the f-stop at which most lenses are the sharpest. At either end of the f-stop range, the pictures are not tack sharp—but still very acceptable. But again, I sharpen them in the digital darkroom. As always, when we look at one of our pictures, it’s important to visualize the enhancements that are available to us in the digital darkroom. I do that for every picture I take. Here is just one example. The adjustments I used are available in Photoshop, Aperture and Lightroom. I took this picture of a ringtail lema at New York’s Bronx Zoo (Image 15). The picture lacked contrast and was cool (in color), due to the lighting conditions. So, I increased the contrast a bit and then warmed up the picture by increasing the yellow tones. I also boosted the color saturation a bit for more vivid colors. The white part of the broken tree was a distraction, so I used the burn tool to darken it. I also used the burn tool to darken parts of the painted background. I then used the dodge tool to brighten the animal’s eyes. As a final step, I sharpened the image. Want more Photoshop info? Check out my on-line classes at Kelby Training. When I travel, I often pay adults a small fee ($1-5) in exchange for taking their picture. I feel that if I’m getting something out of the photo session, so should the subject. However, when photographing a child or a group of children, I try to find out if I can make a donation to a local school or charity, rather than pay the kids. That’s what I did when I was photographing in Khajuraho, India (Image 16). I recommend this latter approach especially when traveling in countries such as India, where poverty is rampant, and you could get mobbed if you take out your wallet on a crowded street. One final tip on being a travel photographer: people tell me that I have the best job in the world and that I am very lucky. I do have a great job, but as far as luck goes, I say: the harder I work, the luckier I become. Face to Face: Rick Sammon’s Complete Guide to Photographing People, use promo code F2F35 during checkout to receive 35% off the book. Rick Sammon has published 28 books, including Face to Face—The Complete Guide to Photographing People, Idea to Image, Rick Sammon’s Travel and Nature Photography, Rick Sammon’s Complete Guide to Digital Photography 2.0, Rick Sammon’s Digital Imaging Workshops, and Flying Flowers—the Beauty of the Butterfly. In October 2008, Rick’s 29th book will be published: Exploring the Light—Making the Best Possible In-Camera Exposure. Rick gives more than a dozen photography workshops (including private workshops) and presentations around the world each year, in addition to presenting at Photoshop World. Rick is also the author of the Canon Digital Rebel XT lessons on the Canon Digital Learning Center and is a Canon Explorer of Light. Text ©2008 Rick Sammon. Photos ©2008 Rick Sammon. very nice and interesting article. I believe it will help many people to improve their travel photography. I'm a pro travel photographer for almost 20 years too. Your tips are great, maybe one thing I would recommend especially for new travel photographers is to plan a trip before they leave. As much as we hate to plan a trip, mostly because we want to be as flexible as possible, it is a must. We just been on the road for 2 years (yes, you heard right, 2 years without a break or a home), while we did Canada across and a lot of Europe we could very clearly see... as better planned as more successful our pictures were. Make notes before you leave home what you 100% sure want to photograph. Start planning around those shots, find out what else is close by. Travel photography is not only about the greatest and most beautiful shots - it should be seen as a coverage of a certain place so don't pack your camera away only because the light is not perfect. I thought this may is another tip for good and successful travel photography. Good job. I'd add one thing, don't be afraid to shoot people. I knew a guy in China that would try and take shots of the monks on the sly. I kept telling him to just go up and ask if he could shoot them, the images would come out so much stronger with getting that 'eye contact' as shown above in Rick's article. He was too shy at first, but I would keep going up and asking the folks for him, just to show him 95% of them would say ok! I would make small talk first, showing them I was human, many spoke a bit of English. At least say hello in their language; they love that as most tourists don't even learn that!!? Sometimes I could not communicate except for a smile and to point to them and then the camera. They would mostly shake their head yes, sometimes no but mostly yes, and I'd get the shot. 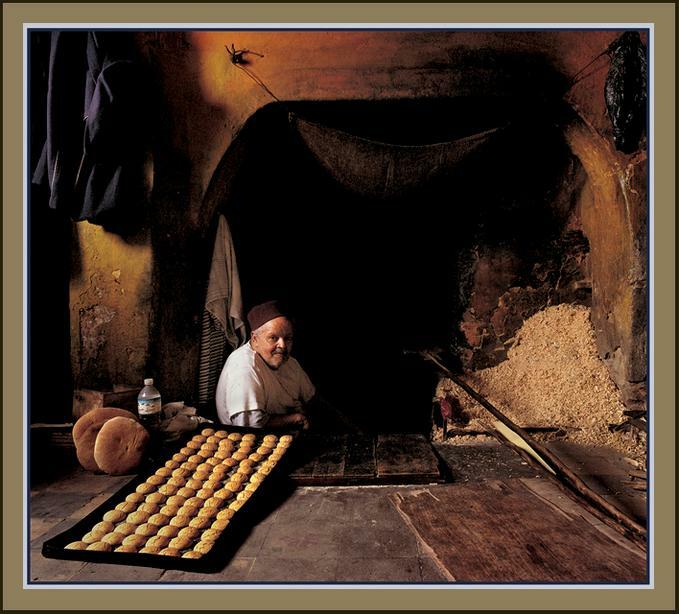 The above pic of the baker was made just that way, he did not speak a lick of English, nor me Arabic. Shot with a Hasselblad medium format camera, available light w/ tripod, no flash. Terrific article. Huge tips. Printing and sticking in the bag now. Helpful article, thank you. One typo: many of us would love a Canon 100-400mm f/4 IS lens, but we have to make do with the f4.5-5.6. Ok, so if someone wants to leave their shirt & tie job and do this, or in my case in a few years I can do an early retirement from my day job, how is this endeavour funded? Are travel photog's working for an agency that is already contracted to buy your photos, or are you on your own and hope someone likes them enough to purchase once in a while? Great article by the way, thank you. Rick, great tips! 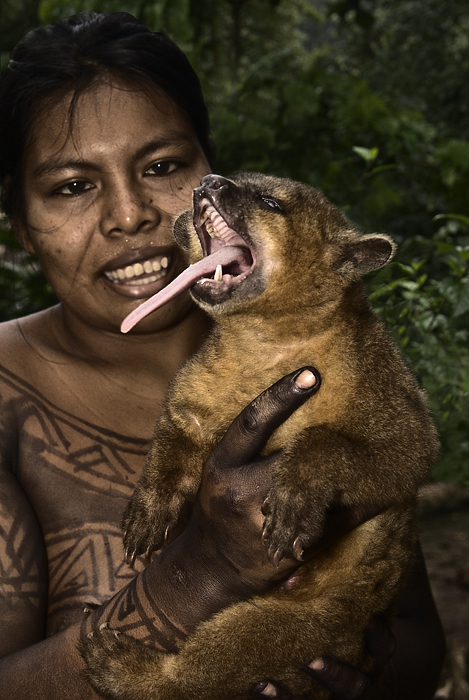 I agree that hiring local guides is key to getting shots you'd never have access to otherwise. I'm forever trying to figure out ways to get off the beaten path on the photo tours that we lead. Most guide books don't offer information about arranging authentic cultural opportunities (which is the highlight of travel for me). I recommend contacting the tourist board and searching the Internet for private local guides for hire, then making your requests known! A couple more tips: Pretend you're on a magazine assignment. To illustrate a travel article you'll need establishing shots (wide angle 14-35mm, ie: woman walking through a forest), storytelling scenes (mid range 28-70mm, ie: woman digging a hole), and close-up details (70-200mm, ie: scorpion on the end of the bamboo stick). A variety of shots will help capture the true essence of a given destination. Try to include people in your pictures as much as possible. Even in landscapes. Adding a person into the frame not only provides a sense of scale but a flavor of the surrounding culture. Just smile, gesture toward your camera for permission and click away. People are usually flattered when you ask. Be familiar with your equipment! Capturing those fleeting moments--actions or emotions--depend on knowing how to change your f/stop and shutter speed without fumbling over the controls. It also allows you more freedom to play and produce more creative photography. Very nice article with some good tips. I am wondering how you manage to get signed model releases from people on the street, people in less developed places like much of Africa, Southeast Asia, New Guinea, etc. and with people who can't read English (or sometimes can't read at all)? I second Henry's question. Are signed model releases required for articles/documentaries, or just for commercial use and advertising? thank you very much for this article. I am not a veteran at all on phtotfraphy and this was very very helpful. Thanks for taking the time and initiative to share!